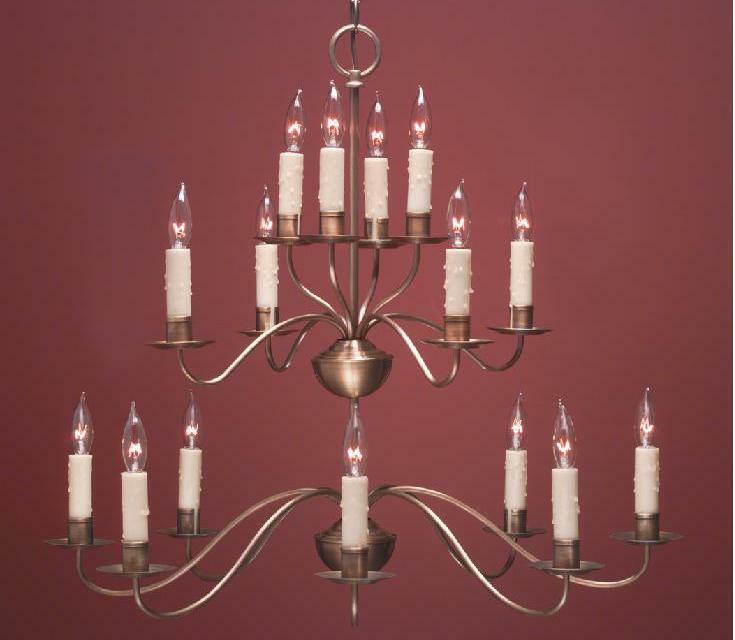 First & foremost, Hammerworks collection of antique reproduction Colonial Tin Chandeliers are handcrafted in New England. 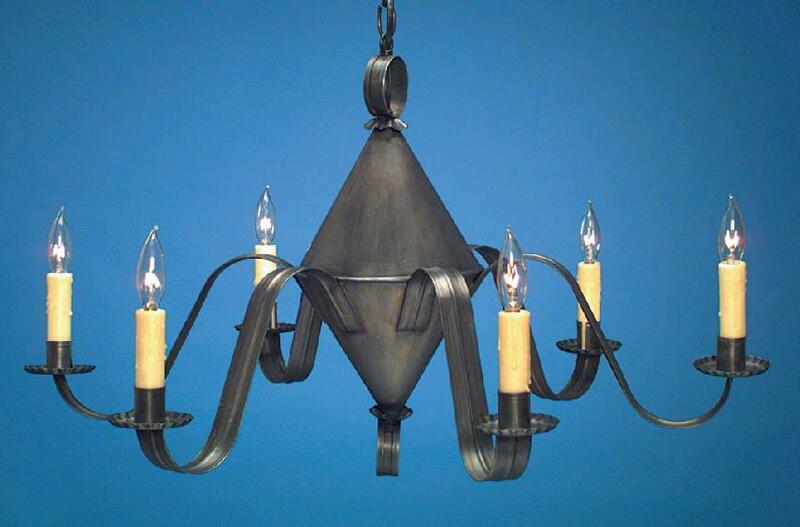 Most notably, our rustic style chandeliers are constructed using only high quality solid antique tin & brass. In addition, just as with our outdoor copper Colonial Hanging Lights, each chandelier is made using the same time honored methods. Most importantly, in terms of illumination, each vintage style chandelier arm is equipped to accommodate up to 60 watts. Furthermore, we provide a matching ceiling canopy and 2 feet of chain with each handcrafted light fixture. Of course, additional chain is always available for a minimal charge. 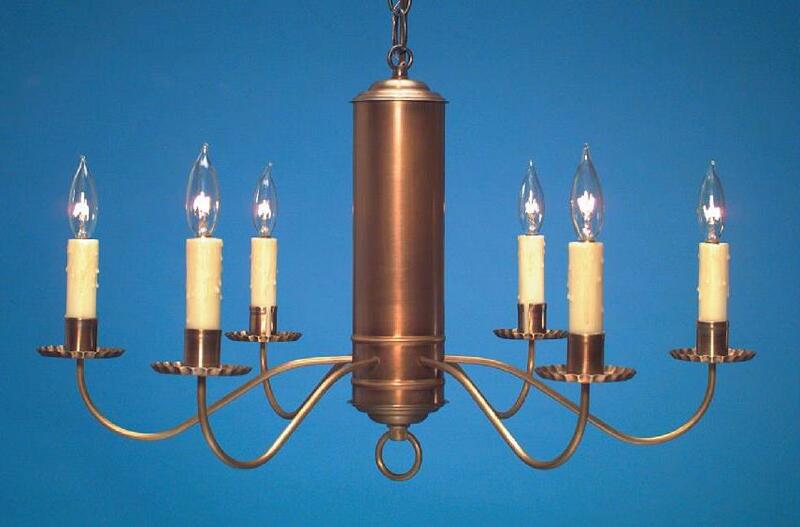 Especially relevant, we skillfully create superb quality Colonial Tin & Brass Chandeliers one light at a time. 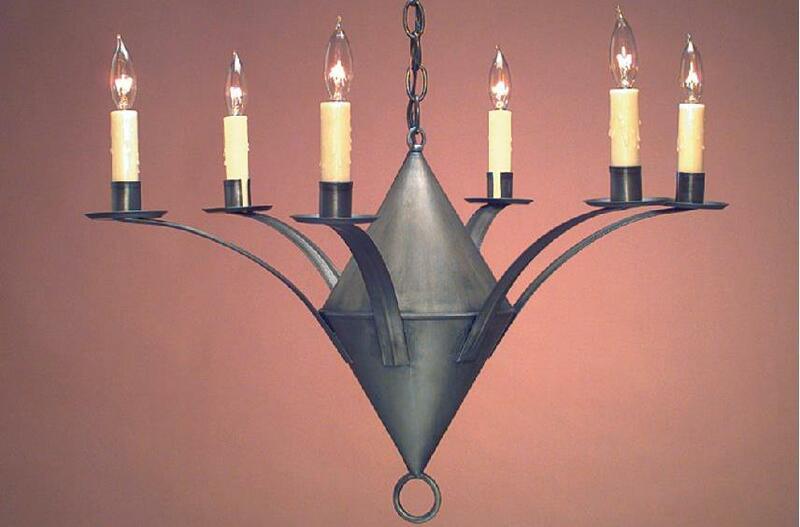 Especially relevant, we make the perfect size Primitive Colonial Tin Chandeliers to fit seamlessly in any room. For example, the smaller models are ideal in hallways, bedrooms, or in a dining alcove. Certainly, the small scale works well in areas requiring door or headroom clearance. 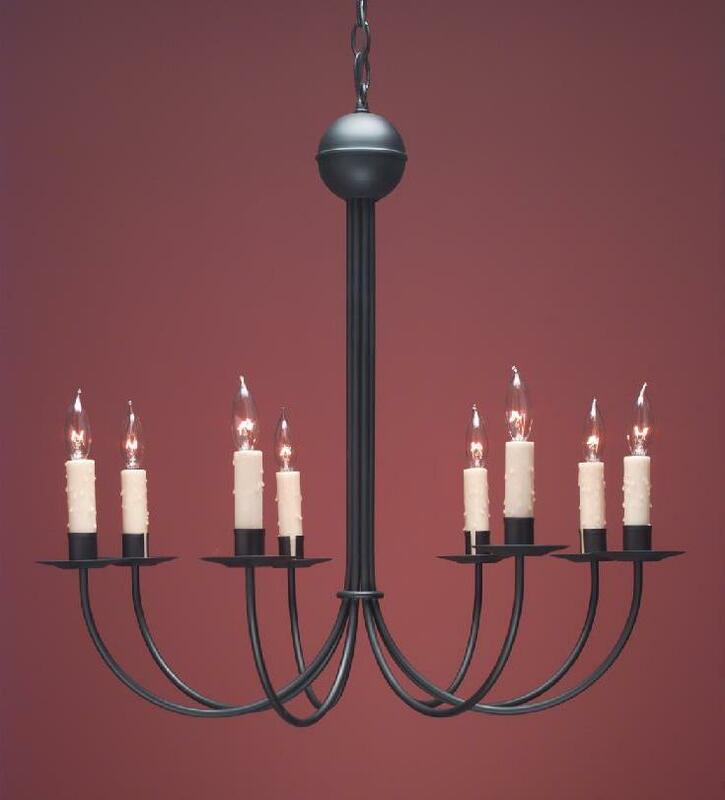 Furthermore, a model such as the Rustic Tin Chandelier CH103 is an excellent lighting choice for a country kitchen. 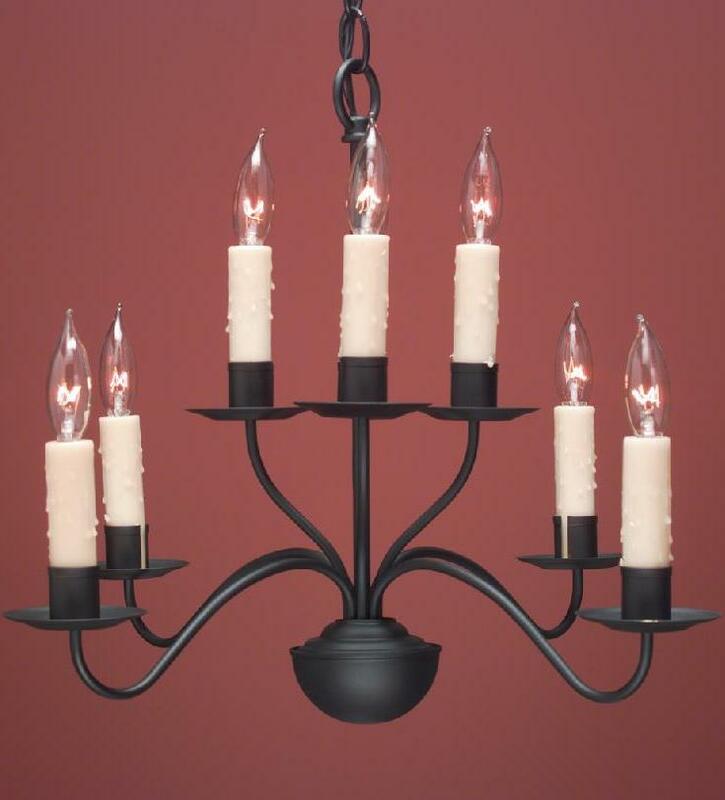 Perhaps you can combine it with the similarly styled Rustic Country Style Chandeliers CH-201 in the great room. 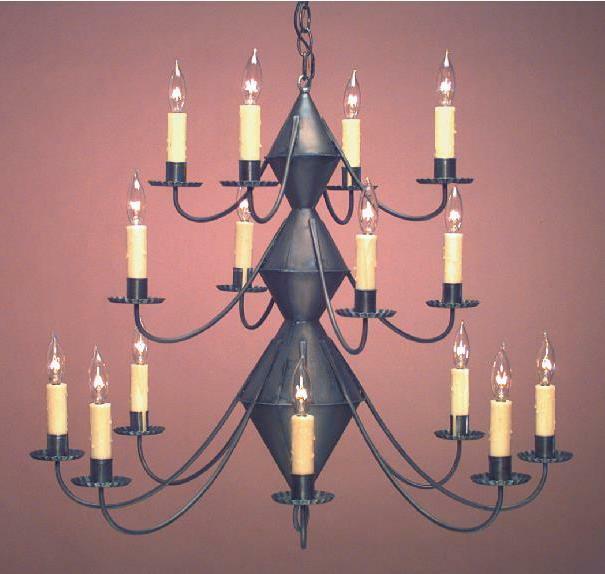 While this two tier 12 light Colonial home chandelier is grand in size, it’s modest in design. Not only that, we make this design in 3 & 6 light choices, making these vintage style tin lights a perfect choice for any room. 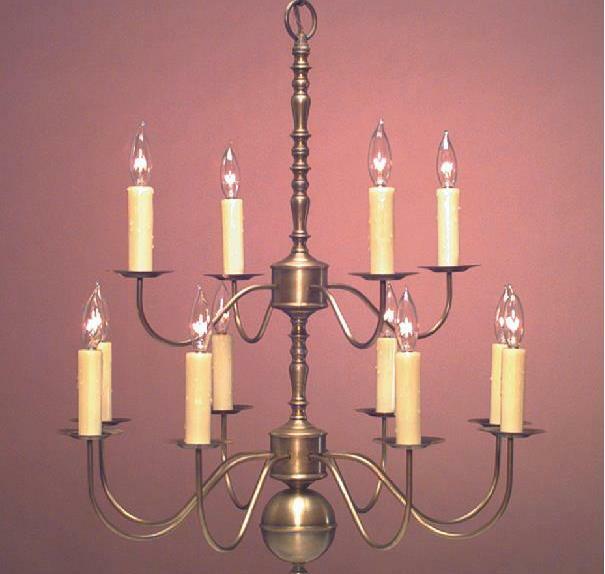 As a result, from kitchens and family rooms to bedrooms and hallways, our Colonial Tin Chandeliers are a perfect decorating accessory for your restoration or reproduction home. Because we offer such a wide range of sizes and styles of Reproduction Colonial Tin Chandeliers, you can easily coordinate with your decor. In addition, consider pairing them with any of our Early American home Colonial Wall Sconces to complete the design of your room. 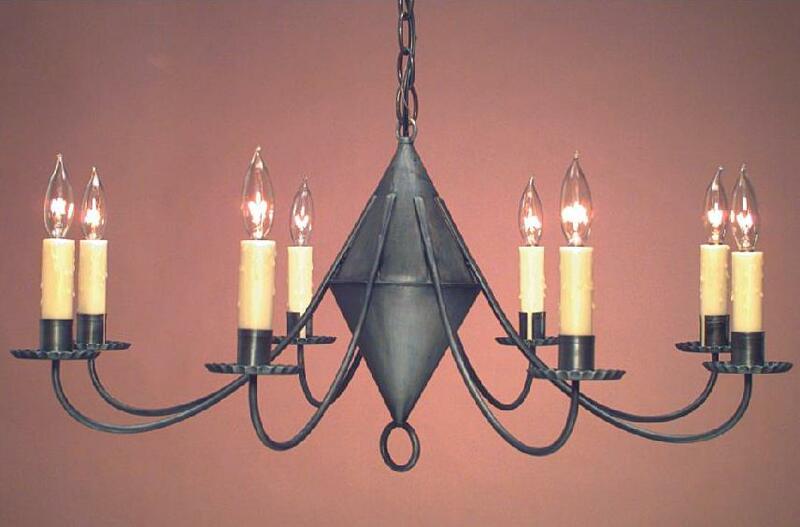 Above all, for home styles such as an Antique Williamsburg, Early American Reproduction, or a New England Farmhouse, we offer the ideal reproduction Colonial tin chandeliers. 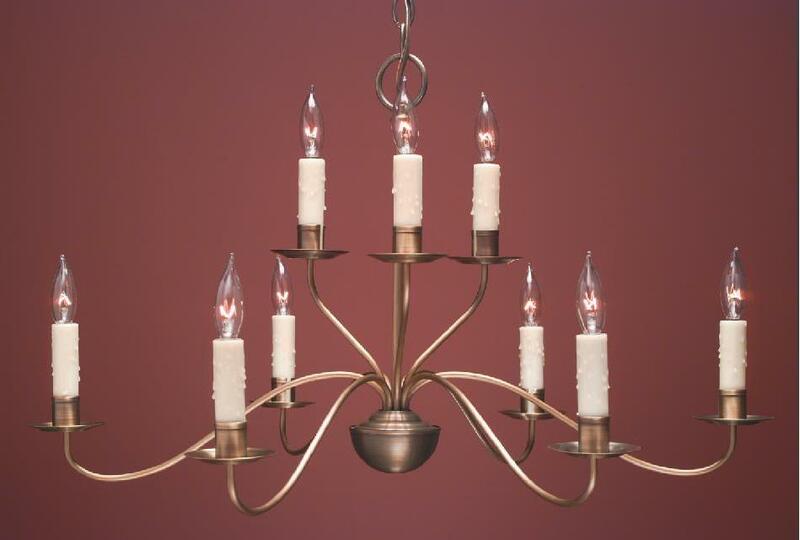 Most notably, we offer a variety of single, double, and triple tier Colonial Home Brass Dining Room chandeliers. Therefore, a simple rustic style single tier Colonial brass chandelier may be the right choice in an intimate dining area. However, any of our 2 & 3 tier Early American home period brass models are ideal for a large area. 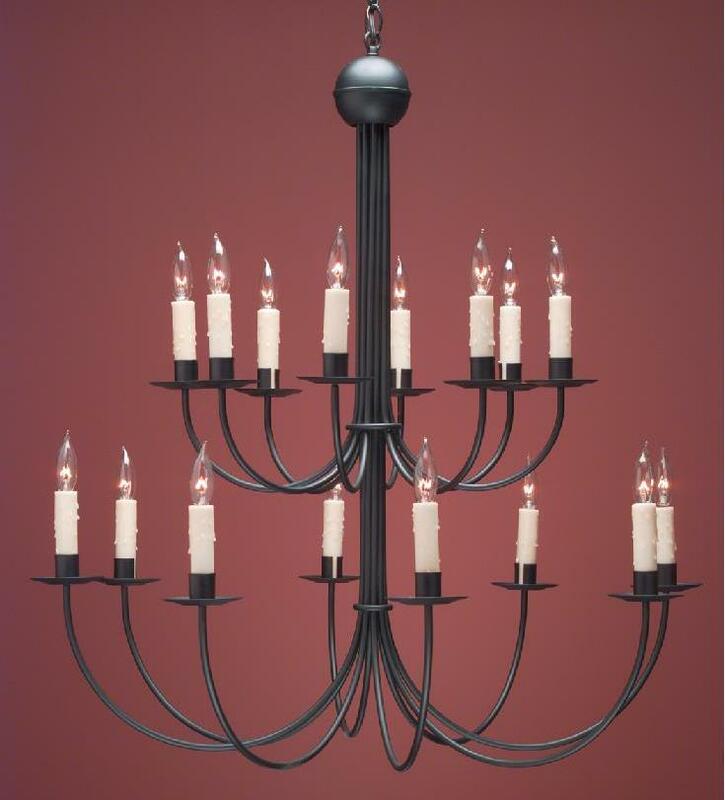 For example, the CH100 2 tier 12 light chandelier, as well as the equally impressive Early American Tin Chandelier CH303 are perfect choices. Of course, due to their size, these chandeliers are ideal in a grand dining room. In addition, they are an imposing presence in a large foyer or great room. As a result, our reproduction brass chandeliers, as well as Colonial Wood Chandeliers impress in any formal or primitive 18th century setting. Certainly for a less formal appearance, Hand Punched Colonial Tin Chandeliers are perfect for any reproduction period home. Most noteworthy, as with all of our handcrafted lighting, we apply the punched design completely by hand. Hence the result is a reflection of the pierced design on the ceiling, adding a rustic charm to any room. In addition, these rustic Colonial Pierced Tin Chandeliers & pendant lights come in a choice of antique tin or brass finish, with a variety of arm configurations. Also, there is a “down light” in the center cone for added illumination. 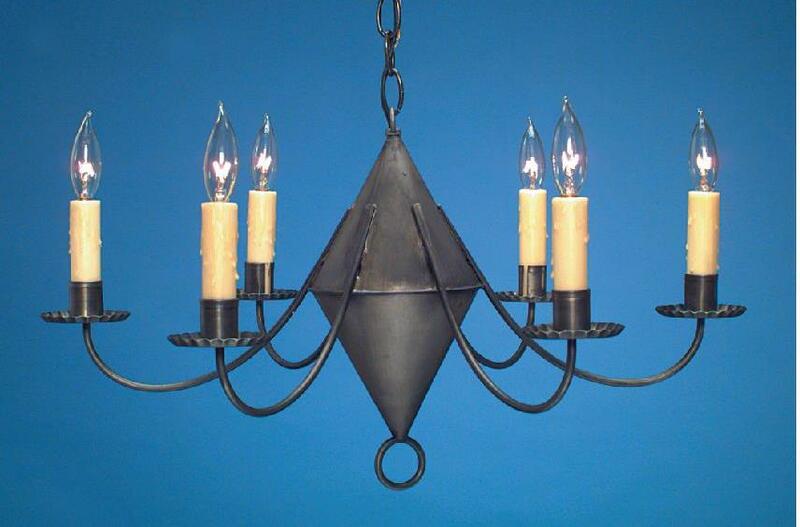 Furthermore, choose the primitive tin “Witch’s Hat” Chandeliers without the punched design if you prefer. Of course, we offer Punched Design Ceiling Lights to coordinate nicely with the punched Colonial tin chandeliers & pendants collection. 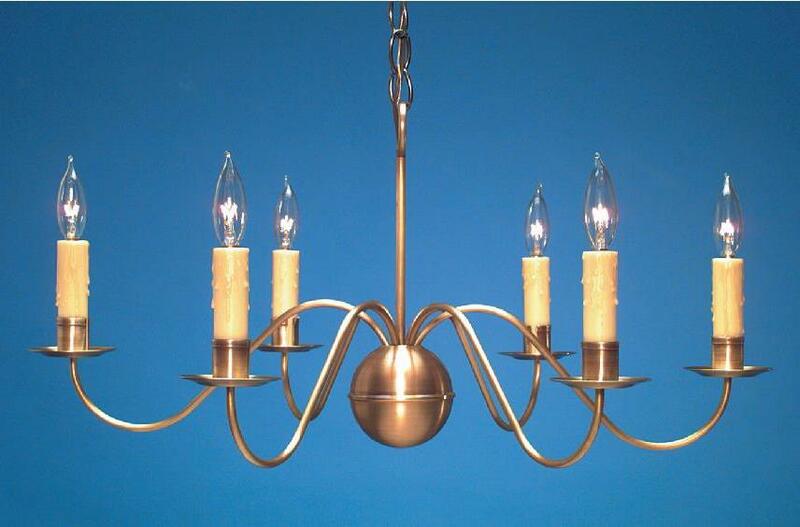 No matter what, whether you want a primitive or formal look, we have a tin or brass chandelier for you. 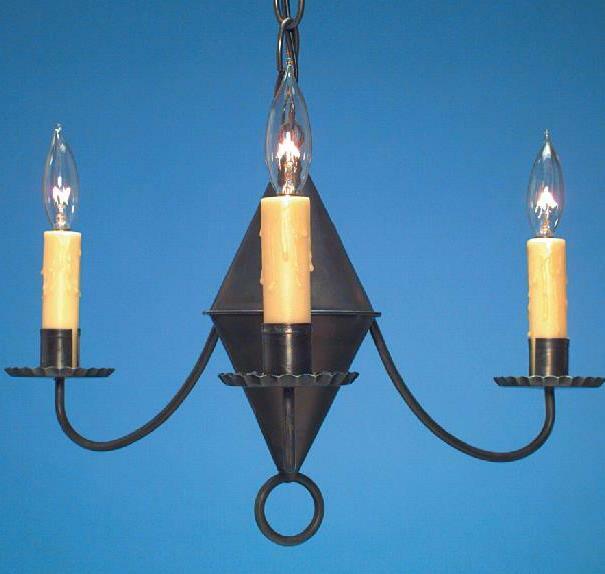 Colonial Tavern Lights were a popular style in the earliest Colonial gathering places. Of course, their simple design and durable construction made them dependable light sources in busy, rowdy environments. Over time, they flourished in taverns and inns across America, thus earning their name. They remain a popular choice for such venues even today, as evidenced here at the “Liberty Tavern” in Powell Ohio. Today the timeless look of a Tavern Light chandelier fits perfectly in many areas of the home, such as a country kitchen, mud room, and even bathrooms. First & foremost, the quality, craftsmanship and elegance of the Grand French Country Chandeliers enhances any setting. Because of their classic elegance and simplicity, the unique appearance of these fixtures complements a variety of home styles. Therefore, whether they grace the dining room in a city Townhouse or the great room of a vintage French Provincial home, these lovely chandeliers are ideal. Furthermore, the Grand French Country Chandeliers in our collection range in size. Choose from the small FCCH-503 to the imposing FCCH-510A models. 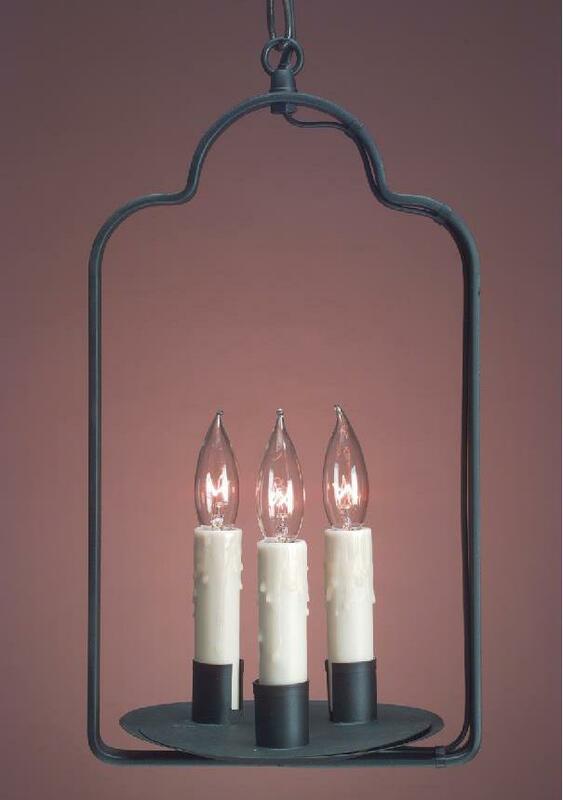 Above all, we create French Country Home lighting in a choice of antique brass, tin and painted black finishes. Therefore, you will find just the right model to coordinate with your decor. No matter what, whether your design is simple or formal, there is a size and style for you. 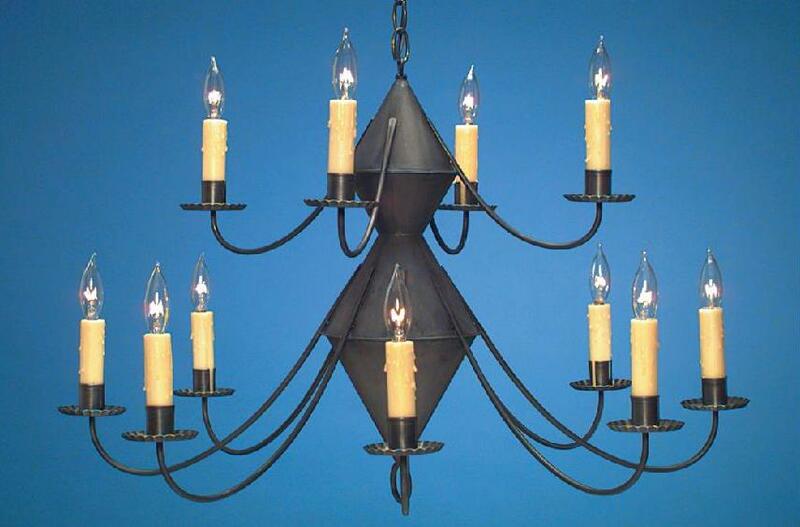 Most noteworthy, we offer a complete collection of Colonial Lighting for both the interior and exterior of your home. 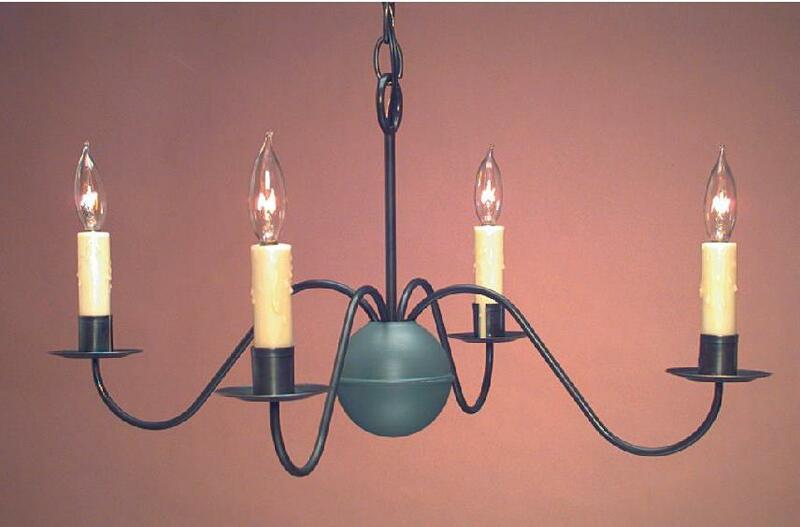 Our Colonial Onion Lights include Onion Wall Sconces, Post Lanterns and Hanging Lights. In addition, our exterior handcrafted Colonial Wall Lanterns & post top styles range from traditional to primitive in design. Most importantly, all of our Colonial outdoor lighting is made in a choice of solid copper or brass, with a variety of finish options. No matter what type of Colonial lighting you desire, at Hammerworks we create the size, type and style to satisfy your needs.